Prince Harry and Meghan Markle have married at St George's Chapel in Windsor Castle. In a ceremony watched by 600 guests — and millions of people on TV worldwide — the pair vowed to love, comfort, honour and protect each other. The word obey was omitted — one of the many traditions broken during what is considered to be the most modern Royal wedding in recent history. Ms Markle entered the chapel alone before walking along the quire arm-in-arm with heir-to-the-throne, Prince Charles. Visibly nervous before the big moment, Prince Harry was nothing but smiles as he saw his bride. "You look amazing," Harry said to Ms Markle. Kept apart the night before the wedding, Prince Harry and Ms Markle held hands as they spoke their vows. 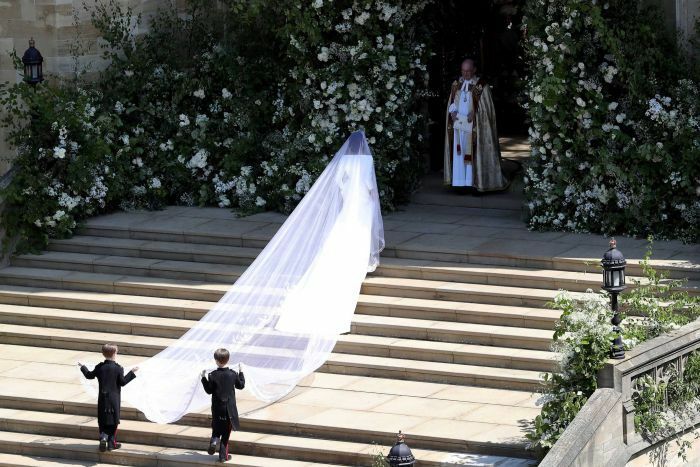 Ms Markle's smile could not be hidden by her five-metre long veil. It beamed from the moment her car was captured leaving her hotel on the way to the chapel with her mother at her side. 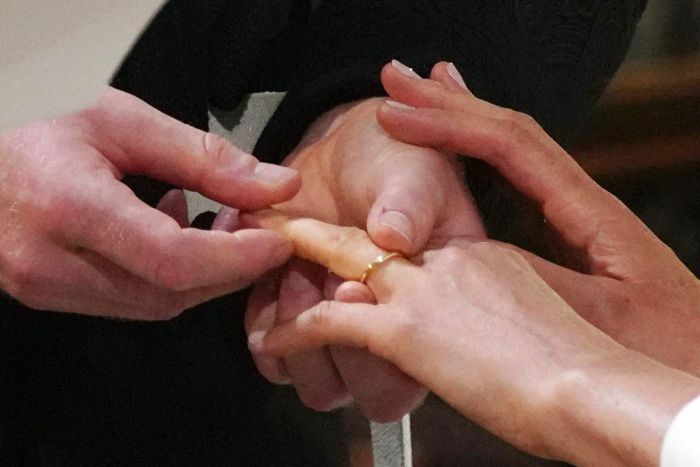 The two exchanged rings without incident — Archbishop of Canterbury Justin Welby had said he was concerned he would drop them. Ms Markle's ring was fashioned from a piece of Welsh gold, gifted by the Queen. Prince Harry's ring is a platinum band with a textured finish — another break from tradition as senior male British royals do not traditionally wear rings. The rings were carried into the chapel by The Duke of Cambridge, Prince William, who returned the favour of being best man to his brother following his wedding to the Duchess of Cambridge in 2011. After saying the crucial words "I will", Prince Harry and Ms Markle became husband and wife but also the Duke and Duchess of Sussex. Prince Harry also gained the Scottish title, the Earl of Dumbarton. 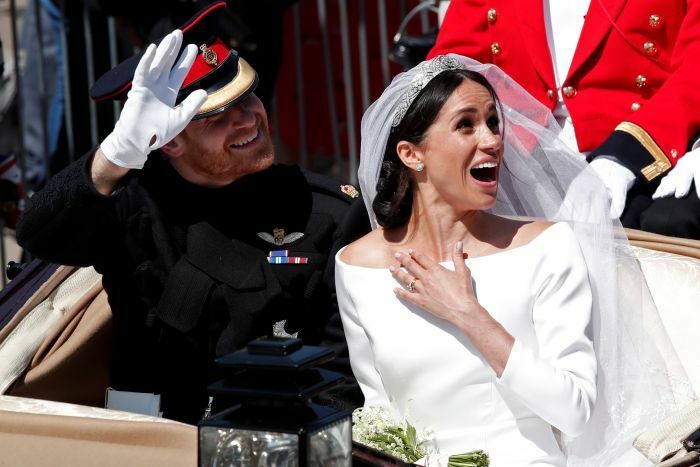 The royal newlyweds took a short trip through Windsor in a horse-drawn carriage, to the delight of thousands of well-wishers. The couple, who met on a blind date set up by a mutual friend, say their meeting was "love at first sight". After just two dates Prince Harry whisked Ms Markle off to Botswana where they camped under the stars. 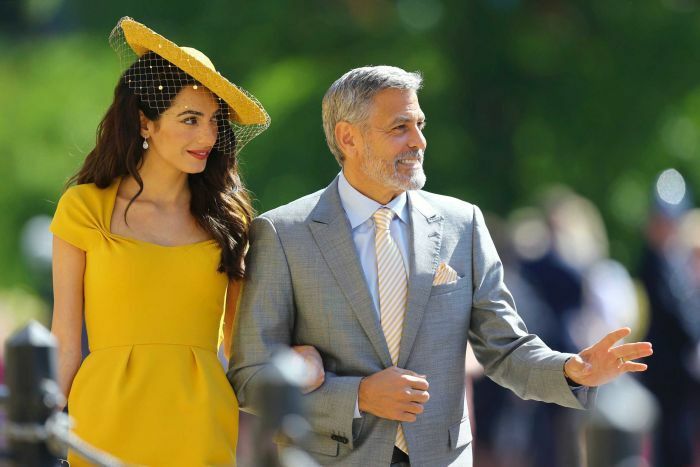 Saturday's wedding also had star power of a non-Royal variety — George and Amal Clooney, David and Victoria Beckham and Ms Markle's co-stars from the TV show Suits were among the guests at the chapel. Ms Markle, a divorced former American actress, was born and raised in Los Angeles. Her African-American mother, Doria Ragland, shed a tear as her daughter stood at the altar with her future husband. Ms Markle's father Thomas Markle, who is white, was not at the ceremony, having this week announced he would not attend due to ill health. 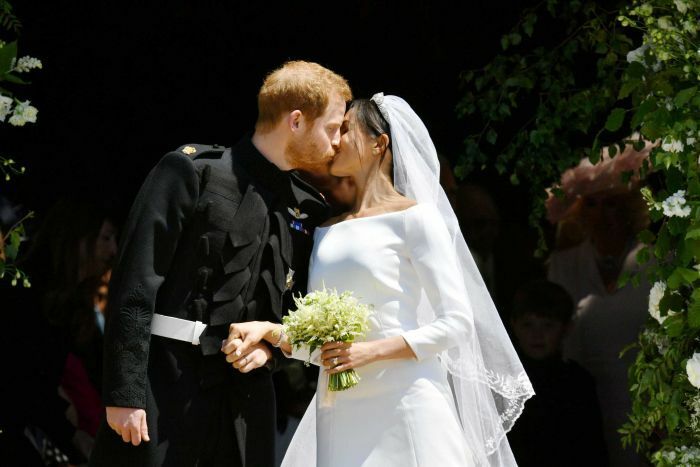 The wedding strongly reflected Ms Markle's background and feminist beliefs as well as the couple's modern take on royal traditions. A sermon was delivered by a black American preacher, Reverend Michael Curry, who electrified the congregation by quoting Martin Luther King. "We must discover the power of love, the redemptive power of love, and when we do that, we will make of this old world a new world. For love, love is the only way," he quoted. The gospel Kingdom Choir performed the 1961 soul classic Stand By Me by Ben E King.